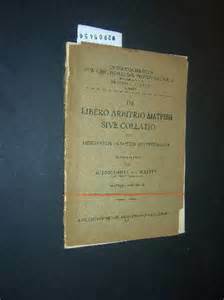 Written in 1524 as a response to Martin Luther’s Assertio omnium articulorum, in which Luther wrote that “everything happens by absolute necessity” (Watson, 13),  Erasmus’ De Libero Abritrio Diatribe Seu Collatio offers Erasmus’ fullest treatment of his theological anthropology, namely that human freedom must coexist with the divine will in matters of salvation. As much has been written on this topic, our purpose here does not include considerations of Erasmus’ arguments concerning the will. Instead, by our review of Erasmus’ theological construction in this work we hope to demonstrate his perspective on scripture, canon, and authority. He begins this work by noting his limitations, immediately noting the difficulty in examining difficult passages and concepts, arguing that extreme care must be demonstrated in the interpretation of scripture (Diatribe, 35-7). Appealing to the “inviolable authority of the Holy Scriptures” and “decrees of the Church,” Erasmus nonetheless concluded that there are “secret” places in the scriptures that God has not wished men to fully understand, and that attempts to understand such passages lead to confusion of human minds (Diatribe, 37-8). While allowing for a certain degree of probability in the interpretation of scripture, Erasmus made clear his understanding that uncertainty does not necessarily undermine Christian faith, instead functioning as a means of humility and caution (Diatribe, 39). Turning to his consideration of the human and divine wills, Erasmus quickly notes the focal point of the argument between Luther and himself, namely, the meaning of the scriptures, not the writings to be considered authoritative for the construction of theological concepts (Diatribe, 43). A key component of Erasmus’ argument involved his appeal to the writings of the church fathers on the topic of the will, as he argued that while a single interpreter may err, the probability of the entirety of church tradition having fallen into corruption remains highly improbable (Diatribe, 42-6). Erasmus’ interpretation of Romans 9, especially, closely followed that of Origen, Jerome, Ambrosiaster, and Pelagius (Payne, 121). Following this line of thinking, Erasmus argued that in practicality an appeal to “scripture alone” really meant an appeal to one’s own understanding and spirit, writing that he cannot trust his own spirit enough to evict the writings of the fathers (Diatribe, 46). Turning to specifically textual arguments for a free human will, Erasmus drew from the Wisdom of Sirach, the Genesis fall narrative, and Paul’s appeals to the natural philosophy of the Greeks as scriptural supports for his position (Diatribe, 47-51).Similarly, it has argued that in many cases Erasmus agreed with Origen’s understanding of the character of God, thus demonstrating his appeals to a form of philosophical reasoning (Payne, 123). From our contemporary perspective it should be noted that by-and-large Erasmus engages in literary proof texting to form his argument, that is, while he uses the literary and semantic context of passage to argue for the meaning of a specific word of phrase, he generally take passages out of their immediate socio-historical contexts to perform his interpretation. Throughout the Diatribe Erasmus also appealed to what he considered basic philosophical discourses and the unity of Christian philosophical thought concerning the will during the medieval period (Diatribe, 51-4). Having briefly cited ten additional Old Testament passages in support of his position, Erasmus turned to the Gospels According to Matthew and John for support of his argument (Diatribe, 56-61). His argument further dwelt in the writings of Paul, citing passages from Romans, First and Second Corinthians, and First and Second Timothy in favor of his position before closing his arguments for free human will from the epistles of Peter and John (Diatribe, 61-4). Erasmus’ considerations of passages opposing his position included considerations of Exodus, Romans, and Isaiah, though in each case he concluded that textual reconsideration made clear that the passages were not espousing Luther’s conception of the bound will (Diatribe, 64-6). Following this lengthy section on textual interpretation, he offered some reasoned arguments from a conglomeration of such passages, appealing at once to the scriptures, rational thinking, and some general theistic philosophical claims concerning the character of God (Diatribe, 66-74). Later, in his section rebutting Luther’s Assertio, Erasmus appealed to Greek manuscript textual arguments a and constructions concerning the original meaning and context of the passages being used by Luther as well as offering scriptural rebuttals to his arguments (Diatribe, 74-85 and Payne, 133-4). His final consideration involved calling for moderation in the consideration of such topics as the relationship between the human and divine wills, again appealing to the obscure nature of certain scriptures and need for humility in making claims about God (Diatribe, 86-97). Erasmus’ use of scripture, canon, and authority in his Diatribe demonstrate several defining features. First, Erasmus displays what could most fairly be called a disposition toward the affirmation of human free will based upon a variety of sources within the history of the Christian tradition. That is to say that by no means does he limit himself to arguments solely from the writings of Christian scriptures. Second, he appeals a great deal to the traditions of the church, be they the theologically oriented interpretive writings of Origen, Jerome, and others, or the philosophically oriented perspectives building upon Plato and medieval scholasticism. 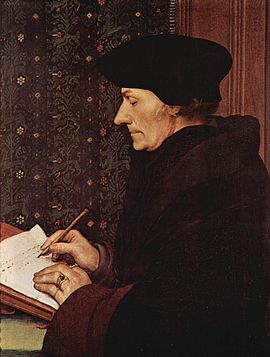 Third, Erasmus indicates an acceptance of a wide Christian canon of writings, including the writings of the Old Testament and the Apocrypha, though these writings he tends to read in light of the writings of the New Testament. And fourth, Erasmus’ main source of authoritative material for his argument consists in his use of New Testament writings, these especially being subjected to textual and literary arguments. These features in hand, from Erasmus’ writings in his Diatribe it seems clear that he found the entire Biblical corpus, though especially New Testament writings, having been subjected to critical examination and crossed against traditional sources to be the final sources of authority for the church. Having now reviewed Erasmus’ perspective, we now turn to our examination of Luther. It is worth nothing that in the German edition of this work, Luther’s claim does not come off nearly as strong, making no mention of necessity. In this translation of his De Libero Arbitrio, Erasmus argues against the theology of Martin Luther, especially his interpretation of scripture concerning the theological anthropology of the human will. For a while Erasmus and Luther were viewed by many in their own context as rather similar in scholarship and mind, this work represents Erasmus’ clearest disagreements with Luther on the nature of human existence before God and the authoritative and interpretive implications of his philosophia Christiani.